In the winter of 2007, exactly nine years before Donald Trump became president of the USA, I was a regular visitor to Trump Tower. Not as a guest or an admirer though: each time I went to 725 Fifth Avenue, I went as an inspector, on behalf of the New York Department of City Planning’s Manhattan Office, examining if the building fulfils its obligation to keep its ground floor as a Privately Owned Public Space or POPS. As part of my mission to help the Department rethink its regulation of POPS, I walked around the building’s ground floor, took notes and photographs, before continuing to other sites. 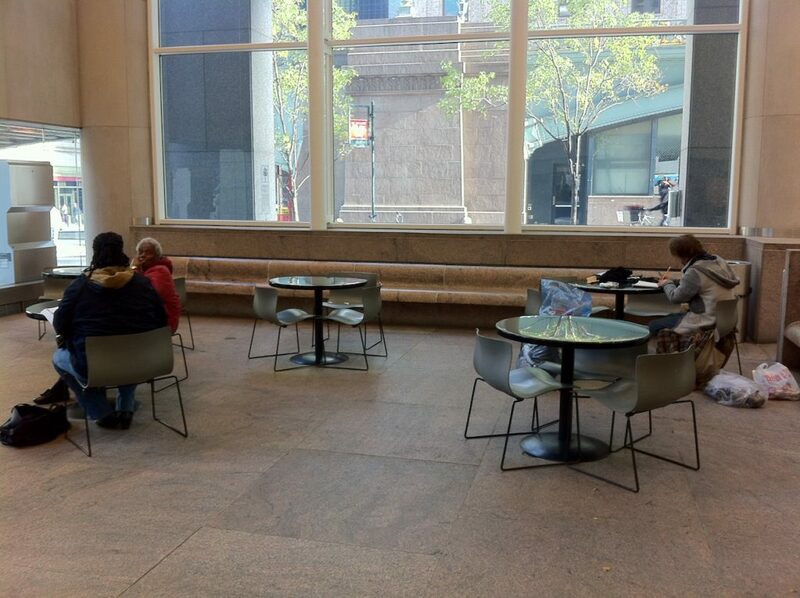 Trump Tower hosts one of New York’s 503 Privately Owned Public Spaces. POPS or public plazas in North American cities represent a hybrid space, created by real estate developers in exchange for height and surface bonuses. This exchange is made possible by zoning codes that are designed to offer incentives to developers in order to contribute to municipal facilities, services and spaces. POPS were invented in New York, introduced by the 1961 Zoning Regulation, in order to find solutions to the city’s budget gaps in providing public spaces: mobilising private funds seemed like a great way to build public infrastructure and the city could offer in exchange something that was seemingly free: buildable surfaces, that is, additional units of the air above land to be built. The program encouraged private developers to provide spaces to the public inside or outside their buildings in exchange for permission to build additional floors. Since its introduction, the program has produced hundreds of public spaces in the city in exchange for additional constructible surfaces or relief from certain constraints of built form. 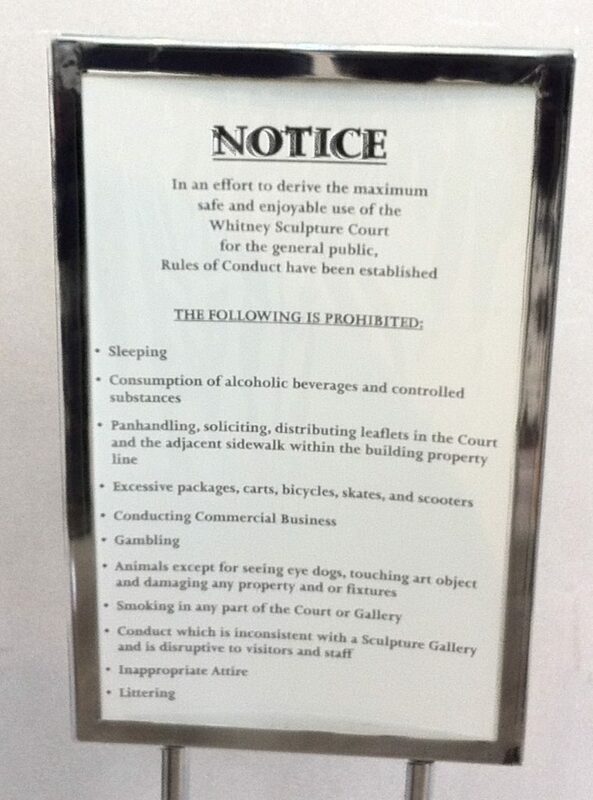 The construction of a POPS or public plaza requires a permission from the City Planning Commission. To obtain this permission, the developer must present plans for the realisation of the public space. The confirmed plan will be attached to the contract and the urban planning agency of the city will regularly visit the plaza to ensure its operation according to the contract. The objective of the design is to attract and to accommodate pedestrians while also assuring the function of circulation. Plans regulate design, define minimum and maximum equipment, the physical parameters of plaza: size, proportions, orientation, access, elevation, treatment of walls, lights, pavement, seats, trees, signs, fountains, tables, playgrounds, and more – the plaza must, in all cases, dispose of the objects described in the plan contract. The first POPS, born in the 1961 generation, were designed after the model of Mies van der Rohe’s Seagram building: with their negation of the street and setback from the line of other buildings they imitated the famous modernist icon’s relative independence from context. The insertion of the “tower in the park” model into urban planning regulations signified the institutionalisation of modernist aesthetic, later generating entire streets like the Midtown area of Sixth Avenue almost as a materialisation of Jacques Tati’s caricature of modernism in Playtime. The modernist aesthetic of public plazas was for a long time accused of an inherent inability to accommodate pedestrians in these public spaces and was blamed for alienating people from urban space. In the following decades, the POPS program has been continually modified, adapting to the experiences and transformations of the urban landscape and resulting in a variety of forms generated by the successive regulations. POPS rules were cyclically rewritten according to changing tastes and aesthetics, and learning from analyses of how the produced public plazas were functioning. These analyses led to important revelations and formerly obligatory but dysfunctional or even excluding elements were removed from the guidelines. Barriers were displaced, the forms became milder, the levels below ground were eliminated, the sidewalks of the street and the plaza were harmonised, the interior spaces were given signs of increased visibility. But even with all these modifications, it is still difficult to define welcoming spaces by rules and guidelines if the designers’ commitment is missing. The critique of the public sector’s relative withdrawal from public tasks and the fear of the private sector exploiting the incentives offered by planning regulations is rooted in the historical discourse of the disappearance of public spaces. Discourses of the public space often disclose a sense of loss, felt over the supposed extinction of the classical public sphere, “a forum in which the private people, come together, readied themselves to compel public authority to legitimate itself before public opinion” (Habermas 1989: 25-26) and public space, a “space of democracy”, (Rancière 2011). Critiques of the elimination of the public sphere often operate with a suggested dichotomy between public and private space: private interests intervening in the public sphere with the means of privatisation or regulation, control and surveillance are eliminating public spaces by expanding the private sphere at the expense of the public. But the traditional notions of public sphere and public space (as antonyms of private sphere and private space) came under criticism in the past decades because of their failure to acknowledge the existence of multiple publics and the blurring boundaries between private and public spaces (Zukin 1991). As Nancy Fraser argues in her book “Rethinking the Public Sphere” (1993), since no single discursive space can represent a completely inclusive “space of democracy,” public expression is dispersed in multiple sites of expression and is organised around multiple publics, with specific limitations, exceptions, filters to the use of any kind of public space. Besides the impossibility of an all-inclusive, Habermasian public sphere for a universal public, Fraser also questions the possibility of a public sphere entirely independent from commercial and political interests (Fraser 1993). Public spaces are often created to foster private advantages, reminds us Sharon Zukin in her last book Naked City (2009). While many of the genuine public spaces of Western cities were originally established to increase the value of neighbouring properties (Zukin evokes the examples of Union Square and Harald Square in New York), associations like Business Improvement Districts or Local Development Corporations took over the maintenance and management of public spaces, implementing new means of control to exclude from the streets all undesirable uses and behaviours and to raise property values in and around public spaces (Zukin 2009). Still, with the interests of certain public and private spheres increasingly intertwined, it is no longer clear if public space offers more freedom and diversity than privately owned or managed spaces. Authorities engaged in gentrifying the areas they govern often operate with a very exclusive idea of “the public”, addressing their services to certain publics and keeping others out of them (Angotti 2008). An eloquent example for the ultimate interwoven nature of public and private interests is the case of the High Line Park in New York. The High Line, an aerial railway structure on the West Side of New York had been abandoned for over a decade when, in the 1990s, discussion started about its demolition or preservation. Private owners of the adjacent lots were lobbying for its demolition, in order to clear the land for new construction. When a group of Chelsea inhabitants started organising themselves to conserve the High Line, nobody expected that the preservation of the structure, its conversion into a public park and the related rezoning by the city’s planning department would lead to a unprecedented rise in real estate prices in the neighbourhood. The mushrooming of new buildings by star architects along the High Line demonstrates the extent to which the same landowners who were willing to demolish the aerial structure finally benefited from the creation of a new, high-quality public space. Besides their fragile structure to balance public and private interests, POPS have also been criticised concerning their design: only a part of the spaces are used as popular places of meeting and leisure, other places invite pedestrians only to briefly pass by or prompt strollers to avoid them. Due to the difficulty of predefining the exact coordinates of a desirable public space in the contracts, Privately Owned Public Spaces have turned out to be an embodiment of the difficult translation between regulatory texts, planning mechanisms, the design of public spaces and their daily use. While the design guidebook of POPS includes precise measures concerning the proportions of the space and the furniture and landscaping elements to be included, the application of these guidelines in the public plazas have often brought ambiguous results. Emerging criticisms of POPS have led to several researchers to investigate the causes of the neglect of certain areas. All these surveys have listed the elements of the seating facilities, and they have compared them in light of the rules. A large study by Harvard professor Jerold S. Kayden gave a detailed view of the structural problems of these spaces and succeeded in creating an incentive for the municipality to rethink the regulation of Privately Owned Public Spaces (Kayden 2000). It was not until 2007 that a research has revealed the political rather than aesthetic origin of the failure of certain public plazas. A survey by Gregory Smithsimon, who conducted a series of interviews with POPS architects, demonstrated the willingness of some developers to create spaces to be avoided, instead of welcoming places (Smithsimon 2008). Additional studies confirmed the design strategies of companies to keep people out of Privately Owned Public Spaces, while formally satisfying municipal requirements and providing a clean, sterile environment for business: many of the POPS were were not designed to be attractive for use but to be appealing for the eye (Németh 2009). In contrast with public spaces, corporate space is designed to maintain an impeccable image, a flat vision instead of a space to use, a landscape instead of a terrain. POPs, in this sense, are not only situated at the intersection of the logics of the public and that of the private: they are also at the crossroads of the logics of business and that of leisure, camouflaging the former with the latter. 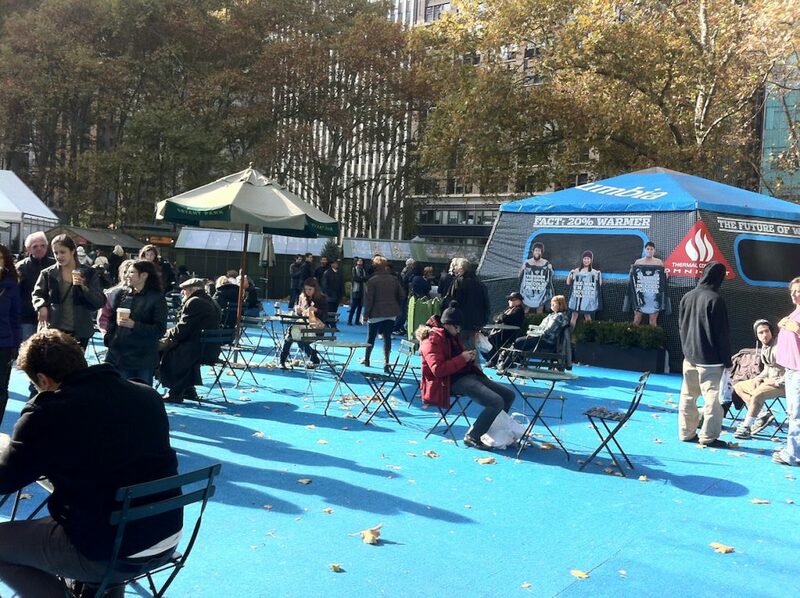 Voluntary depopulation of urban public space is part of the phenomenon of branding public space. The urban landscape thus becomes the showcase of the city, a showcase always made up and controlled. In this logic, the buildings of a city are the continuation of the skyline, an inaccessible vision that is given only to the eye and not to the body: public space here becomes part of the aesthetics defined by the genre of architectural photography that succeeded in emptying streets and squares to focus on images of objects. In recent years, an increasing number of theorists have described the process in which the urban landscape gradually lost its materiality and has turned into the city’s foremost visual representation. As the American sociologist Sharon Zukin wrote in 1995: “The development of visual media in the 20th century made photography and movies the most important cultural means of framing urban space, at least until the 1970s. Since then, as the surrealism of King Kong shifted to that of Blade Runner and redevelopment came to focus on consumption activities, the material landscape itself – the buildings, parks and streets – has become the city’s most important visual representation” (Zukin 1995:16). This evolution, the “spectacularisation of urban space” (Belanger 2000 or Silk and Amis 2006) unfolded in correspondence to the emergence of architectural postmodernism and eventually, iconic architecture. The buildings reduced to their façades or to a city’s or a region’s icons, are as much deprived of activities as securitising and sterilising policies banalise urban streets to become postcards, embodying diverse ideals of the civic order, customised from a variety of 19th, 20th and 21st century elements. However inheriting an appreciation of street life and community values, urban regeneration based on beautified public spaces often looks at streets and squares as mere aesthetic phenomena, partly ignoring their social, economic and ecological dimension (Zukin 2009:116). POPS came to the focus of worldwide attention when in the Autumn of 2011, a small anarchist group occupied Zuccotti Park, a public plaza in Downtown New York. 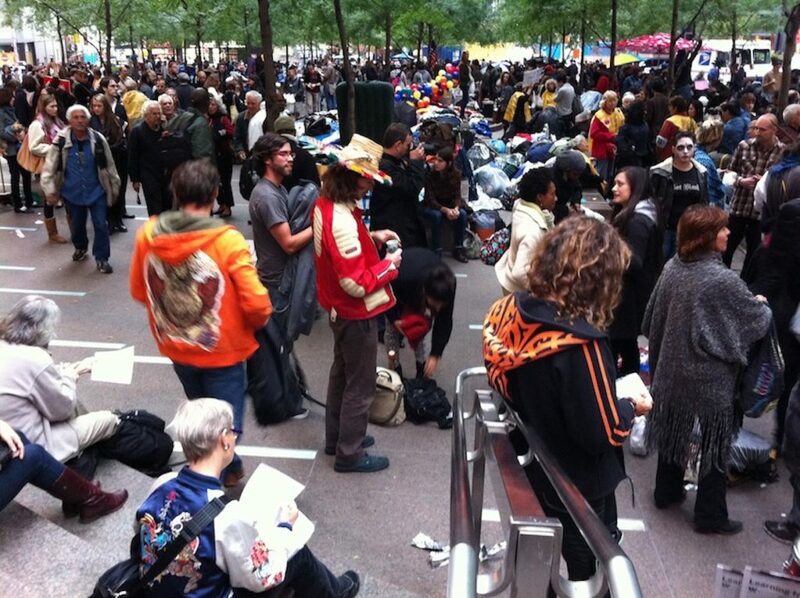 For many observers, the fact that it was possible for hundreds of people to camp for two months in a Privately Owned Public Space in the heart of Manhattan, at few steps from Wall Street, without the police intervening and emptying the area, indicated that the “society of control” still includes inalienable liberties associated with public spaces. It is no coincidence that one of the most important dilemmas of the debate around Occupy Wall Street was the dimension of the spatial dimension: the lawfulness of the occupation of the space creating the visibility of the movement was generated by several contradictory interpretations. While the company owning Zuccotti Park complained about the irregular use of the square preventing the non-protesting population from using the park, it did not take any action in the first months against the occupiers, in respect to their freedom of expression. 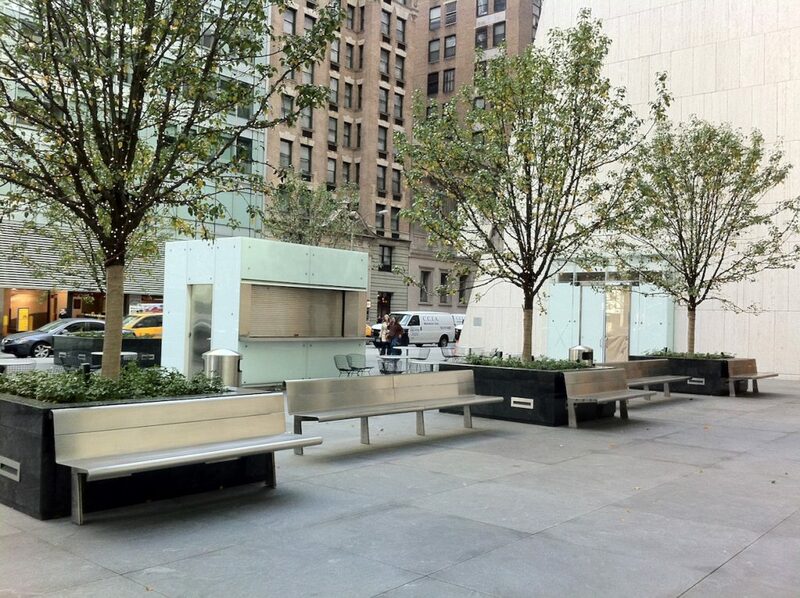 When two months after the occupation began, referring to unacceptable sanitary conditions, the police eventually removed the tents and other structures erected in Zuccotti Park, POPS owners – with the approval of the municipality – began to introduce new rules for Privately Owned Public Spaces. These new rules included the prohibition of lying on the ground, erecting tents, and using sleeping bags, barely hiding the explicitly anti-OWS nature of the new rules. If there was a lot of criticism towards these new regulations (“do parks only have to accept employees who are quietly consuming their lunches? Are commercial tents nevertheless allowed in parks?”), most observers agreed that POPS paradoxically still offer more freedom than their purely public equivalents, public parks, that close at dusk, making any nighttime activities impossible. Privately Owned Public Spaces are not the only established format that transcend the dichotomy of public and private spaces in New York. The city’s zoning regulation, first adopted with the 1916 Zoning Law, was designed to limit the use of privately owned land, in order to reduce new buildings’ interference with existing ones. Another widely discussed tool is rent control, that aims at keeping rents at affordable levels, thus limiting the owner’s liberty to define or adjust rental fees. (Greenberg 2017) These tools are very important in trying to make New York – a private development-driven city with limited public means – accessible and enjoyable for wider social groups. Any property is a bundle of rights and obligations. And although POPS, affordable hosing incentives and rent control try to build on owners’ obligations and turn them into public value, many property owners try to avoid fulfilling their obligations towards the public. The key to assure private property’s contribution to public wealth is making these arrangements as transparent as possible, reinforcing agreements through regular scrutiny and making owners accountable for their attitude towards their obligations. Each time I visited Trump Tower, the POPS in the building’s ground floor were closed off: instead of an inviting public space, the plaza functioned as a construction site, temporarily cordoned around. When the Department of City Planning requested Trump Tower to comply with its obligations to keep the space open, Donald Trump repeatedly threatened to sue the Municipality. Benefiting without hesitation from additional floor area that can significantly increase the building’s profitability, Trump was never willing to give back to the city what he owed: a single well-functioning public space: a familiar attitude we cannot help but recognise after Trump’s first months in public office. Governance / Shared administration, New York , article, design, governance, ownership, planning, public space.